Poor 479 passengers - I know we all slate TfL on here a lot but they would of got someone operating the 479 even on a temporary basis. Wonder if Metrobus is interested in it? I wouldn't be so sanguine about that, remembering the shambles with the 60, then the 42 and (particularly) the 185 with failing or failed operators having to be replaced. OK, may have been LRT then but the principle's the same. Yes but at least a service was maintained instead of the route just ceasing to exist until someone hopes an operator decides to take it on. No wonder Surrey residents don't bother with the bus in some areas. I can't agree with you on that. Far better to admit a service has gone than to pretend a route has 14 buses allocated to it when, in practice, only two may be in service, as happened for MONTHS with the 60. There was absolutely no way any of the public could know if or when a bus was likely to turn up. They were inglorious days in London bus history, worse for sure than the current situation. 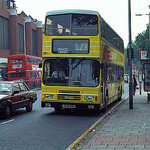 We also had big problems when Eastern National took on the 20 and 167 - staff shortages crippled those routes. IIRC the 275 takeover was delayed in consequence. Also we had a heck of a mess when London Forest went on strike with a right old patchwork of unpredictable temporary services running. I think it would be fair to say that TfL would be a bit more attuned to a potential operator failure and in managing the fall out. They do at least now have contingency plans in place to cover for Tube strikes. Now those tend to have at least 1 week's notice but at least they have call off arrangements with Ensign who take the lead in marshalling cover. They also have a reasonable idea what their regular operators can squeeze into service in required. Obviously no guarantees with any of this that a repeat of the 60 situation could be completely avoided but I doubt things would be as bad. There is also more scope for getting info out to people these days than in the past. I think it's fair to say that TfL would be loath to offer a route of more than a two or three bus allocation to an untried operator these days, and would probably prefer that untried operators don't even try to muscle in. Sullivan Buses have managed to just about get a foot in the door now, but it's been a slow process: i'm not criticising TfL for that. What of course could not be planned for is if the 'unthinkable' happened and a major operator failed i.e. a Persimmon type situation. With our current political/economic mess i certainly wouldn't bet against it happening. The info point is undoubtedly true, but after what I read with bemusement on the GOBLIN thread I wonder sometimes whether a complete absence of info isn't preferable to conflicting info! Forgive me, what happened with the 60? Don’t forget that the 479 has a PVR of at least 3-4 buses so it would require an operator to have that sufficiently spare in their fleet currently not being used. Sounds easy but, talking from experience, logistically it isn’t. Long story... The 60 was awarded to Capital Logistics in 1998. Capital were an existing operator of LT tendered routes but had no base anywhere near the 60. They couldn't get a new base sorted in time so initially the route was subcontracted to Selkent (who had spare resources following loss of 119/320) and Blue Triangle (specialists in magically finding drivers out of nowhere). No problem there, except that the subcontracts could only last until January 1999, at which point Selkent had to concentrate on all the new contracts they'd just won (96, 99, 178, 269 etc). This is where it all went wrong. CapLog still hadn't sorted themselves out, but somehow arranged for the route to be taken on by a Horsham-based outfit called Driver Express, who I think were mostly involved with driver training. Only a few hours before they were due to take over, Driver Express admitted that they couldn't run the route after all. So LBSL had to arrange emergency cover (similar to an emergency rail replacement) with all sorts of weird and wonderful operators. This is the period that busaholic is referring to, when at times there were very few buses on the route. It took quite a while for Capital Logistics to take responsibilty for the route (Driver Express had collapsed in the meantime), but they eventually managed to set up a new base in Beddington and take full control of the route. LBSL did learn their lessons from this episode. After that it was unthinkable that a route could just be handed to a little-known operator (Driver Express) who had zero experience, and with zero oversight of their planning. 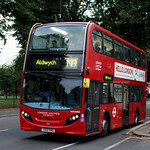 Part of the reason for setting up East Thames Buses was to provide a contingency operation in cases of operator failure. When London Easylink were abruptly taken off the road, TfL managed to get replacement operators on both routes (42 and 185) within a day. Yes it wasn't always smooth, especially on the 185, but at least the services didn't collapse to the extent that the 60 had done. 479 Epsom-Leatherhead-Guildford: Not currently operating as no other company has yet come forward with a plan to replace it"
Currently the 478 (3 journeys Guildford-Leatherhead, 2 journeys Leatherhead-Guildford) covers the general routing of Leatherhead-Guildford that the 479 mostly covered. It's a very limited Surrey CC service operated by Reptons. The Epsom-Leatherhead section is mainly covered by 408 with a generally hourly service except evenings, and some journeys cover up to Effingham. Traveline are currently quoting a minimum journey time of 1hr 41mins between Epsom and Guildford now the 1hr 10min 479 has disappeared. Some results are quoting upwards of 2hrs, and a detour via Kingston. Leatherhead-Guildford is currently quoted via Cobham (408) or via Dorking (465-32) when the 478 isn't running full route. Meanwhile, the 28 will be operated by "plan while ADL E200MMC vehicles" (direct quote from their website) as a "short notice change supported by Surrey County Council". The 28 and 479 were commercial under ETC, and I'm presuming will be under Falcon/whomever takes 479. Let's hope someone does manage to come up with a commercial proposition for the 479. Sadly I can't see Surrey CC funding a replacement service for the whole route if there's no commercial operation. Perhaps they'll be able to at least beef up the 478 a bit to cover the sections that have been left unserved. The 21 and 408 already cover most of the Epsom - Leatherhead section so I can't see any replacement being provided there. With the route still having a Surrey CC contracted service, this reminds me of what happened with the 505 service (Chingford - Waltham Abbey - Harlow). The hourly Mon-Sat service was contracted, but Trustybus began to operate the Mon-Fri service commercially. However, this failed and they withdrew the commercial Mon-Fri journeys, leaving just the contracted Saturday service. The Mon-Fri service has never been replaced, leaving the Chingford-Waltham Abbey route without any direct public transport link on weekdays. A once busy route over 10 years ago. The arbitrary nature of political boundaries can make a huge difference: the one time I travelled on a bus, a 242, between Chingford and Waltham Abbey it was on a 10 minute headway between M-F peaks! I'm was referring to TfL rather than an iteration of LT - when operators have collapsed under TfL control, things have been resolved pretty swiftly. Incredible! Now just 6 journeys on a Saturday. I'd say a route from Waltham Abbey to Chingford could be popular with London commuters - rather than a bus to Waltham Cross station (where trains have already stopped at stations before), a bus to Chingford which is a terminus station with a higher chance of a seat - Chingford isn't exactly far either. That was, I believe, the thinking behind that 242 headway, which occurred when the route was opoed around the time of the opening of the Victoria Line: interchange at Chingford and, for many, again at Walthamstow. I'm not sure the fare structure would have aided that approach, however. Nice to know some things have improved! i'd repeat, though, that if Comfort Del Gro or Go-Ahead, using two examples of an operator quite dominant in a certain geographical area, got into sudden difficulties then there'd be a huge knock-on effect that could last weeks, if not months. Drivers might (mostly) be available, but buses and, as importantly, bus garages might not!